I was a single dad with three kids, a car that didn’t run very well, not enough food in the fridge and a low-paying job when I took on my assigned role at the Community Action Poverty Simulation held by the Department of Public Defense in early August. Within 45 minutes, I’d lost my job, I’d lost my housing, my two older kids were in a heap of trouble at school, and I couldn’t remember where I’d left my 3-year-old. Christopher Sanders, a King County public defender, stands in line at the “bank,” while Rhonda Berry, the county’s deputy executive for operations, grows impatient behind him. At some point during the hour-long simulation, I glanced at the clock and thought, “Phew, only 10 more minutes, and this nightmare ends.” Of course, the point of the simulation was to underscore a different reality: The confusion and chaos of poverty and its attendent stress are a way of life, not a 60-minute exercise, for far too many people. 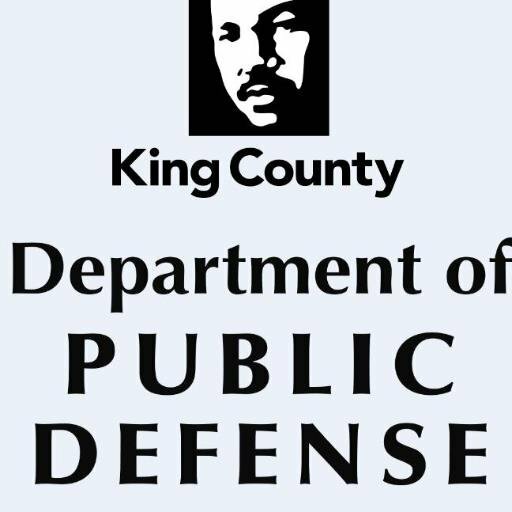 DPD brought the Community Action Poverty Simulation (CAPS) to King County on Aug. 4. About 45 people — public defenders, other county employees, civil legal aid attorneys and community partners — participated, each taking on an assigned role. Lorinda Youngcourt, the director of DPD, was my 13-year-old son. Rhonda Berry, the county’s deputy executive for operations, was a feisty grandmother in a struggling family. Annie Benson, a senior attorney with the Washington Defenders Association, was a 16-year-old girl bound for college until her dad lost his job. Christopher Sanders, a public defender at DPD, was an 87-year-old woman living alone. Christopher, who began working as a public defender in King County a little more than a year ago, already knows a fair amount about poverty. He works in the City of Seattle’s Community Court, where he represents people accused of low-level crimes, what Christopher calls “crimes of necessity and poverty.” Petty theft. Criminal trespass. Public inebriation. Even so, he found the simulation enlightening. CAPS was developed about 10 years ago by the Missouri Community Action Network to help promote greater awareness of poverty. According to the organization, it’s “an interactive immersion experience” that “sensitizes community participants to the realities of poverty.” The simulation is meant to represent one month in the lives of several poor people who live in the same neighborhood, with each 15 minutes representing one week. It’s been used by more than 1,000 organizations around the world. La Mer Kyle-Griffiths, DPD’s training director, had heard about CAPS from a number of different colleagues and friends and decided to look into it. She discovered she knew some of the trained facilitators — public defenders in Wisconsin — so she invited them to Seattle to lead the simulation. Now that she’s tried it out, La Mer says she plans to have DPD purchase the kit and hopes to introduce the simulation to a range of people who work in criminal justice — prosecutors, judges, public defenders and community partners. “People felt it was an eye-opening experience,” she said. Indeed, during the discussion that followed, several talked about their experiences — the anger they felt, the utter despair, the loneliness and lack of support. Some acted out. Kids got in trouble in school. A few of us were “arrested.” I didn’t get caught, but I was among those who engaged in petty crimes. When I was at the preschool picking up my 3-year-old and saw some “transportation tickets” I desperately needed sitting on the counter, I slipped them into my pocket. Interestingly, I didn’t even think about it. The tickets were there. I needed them. I worked fast and did what had to be done. In the end, however, I failed at poverty. My son — Lorinda Youngcourt — referred to me as a “hot mess” of a father in the discussion that followed. My other son, Austin Borcherding, an intern at DPD, jokingly asked me later if I’d remembered the 3-year-old at preschool. I, too, found the experience enlightening. During that one hour, I felt stressed, desperate, frustrated and lost — all because I didn’t have the resources I needed to feed my kids and get to work on time. Leslie Brown is the communications manager for the King County Department of Public Defense.